Have you ever wondered why the string of prayer beads used by Catholics is called a rosary? Well, the answer lies in the bush outside your window. 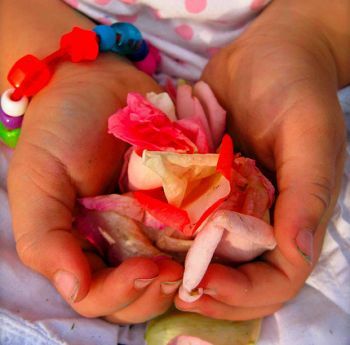 Once, the beads in rosaries were made from rose petals. 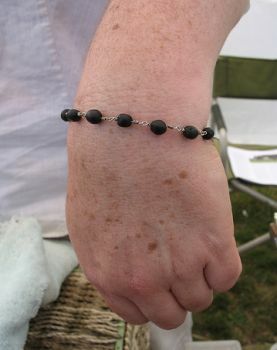 Many modern rosaries are made from wood, silver, or glass, but it is still possible to buy rose beads. 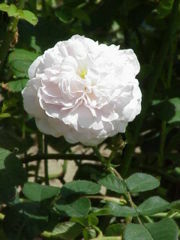 Or, if you are a rose gardener, you can simply make your own. These beautiful and fragrant beads make unique jewelery and a wonderfully personalized gift. Making rose beads from rose bushes (actually, you will use the rose petals from the roses themselves) is not really that hard. It is also a great project that you can do with your kids this summer. Here is how to make rose beads from rose bushes. * Several quarts of rose petals. 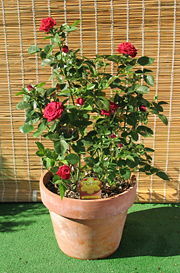 This is an excellent use for the flowers from your rosebushes that are just starting to wilt. First, grind or pulverize the petals thoroughly. Then spread them in the skillet, cover airtight with plastic wrap, and set aside. Once a day for 10-12 days, scrape the mixture out and regrind it. Eventually the petals will turn into a dark, putty like substance. Now you can mold the paste into beads of any shape you like. Put a nail in each one where you would like it to be threaded. Leave the nails in the beads and set them in a sunny spot to dry for a couple days. Remove the nails and, voila! You have rose beads. Happy Jewelery Making!